The city of Aegina is the capital city of the island and it’s located on the west side. It’s built amphitheatrical towards the sea. When you enter the harbor, the small, white church of Saint Nikolas welcomes you. Your first impession is the modern type classical buildings, which are located along the sea front of the island and have terristrial shade colors which make them look even more beautiful at sunset. The economic and social life of Aegina is centralized on the coastal road and the parallel roads.Take a ride on the horses and the carriages, walk in the narrow, paved streets and see the traditional houses, the churches with the blue domes and the shops with folk art. Don’t miss seeing the fish-market, the traditional restaurants that serve snacks with ouzo (a greek drink). Also the fishing boats, that are not only used for fishing but for seiling groceries as well. And finally don’t forget to buy the famous peanuts of Aegina. It was founded in 1828 by Ioannis Kapodistrias. In the museum,there are different vessels, pottery, ceramics, alabasters,statuettes,inscriptions, coins, weapons and copper vessels. In the lobby of the museum, there is a representation of the first greek residence, called “the white house”. It had 2 floors and a loundry that was made of copper and embossed tombs from the cemetary of Rineias. Today, at Markello’s tower, is the Spiritual center of the Municipality of Aegina and the center of social speculation called “Spiros Alexiou”. The Cathedral was also used as a parliament house in 1827 and in 1828 for the first greek goverment. In the Cathedral, there are many historic relics, a marple icon screen, remarkable murals and icons. In 1830, after a donation made by a Swiss banker called Eunardios, the Eunardios School of Teaching was built next to the Cathedral which is a neoclassic building. The Government House is located near the Cathedral, in the center of the city. The Monastery of Saint Nektarios was built around 1904-1910 by the bishop Pentapoleos Nektarios. Nektarios lived in the Monastery and died in 1920. In 1961 he was declared a Saint.The Monastery is on the road to Saint Marina and it’s about 6 kilometers away from the town of Aegina.The church has two tall bell-towers and 4 rows of windows which all have red archs for crowning. Fourteen nuns live in this Monastery. The Monastery celebrates on 9th November and thousands of people gather on this day from every part of Greece. There are many rows and dedications made from a great numberof worshippers in this Monastery. 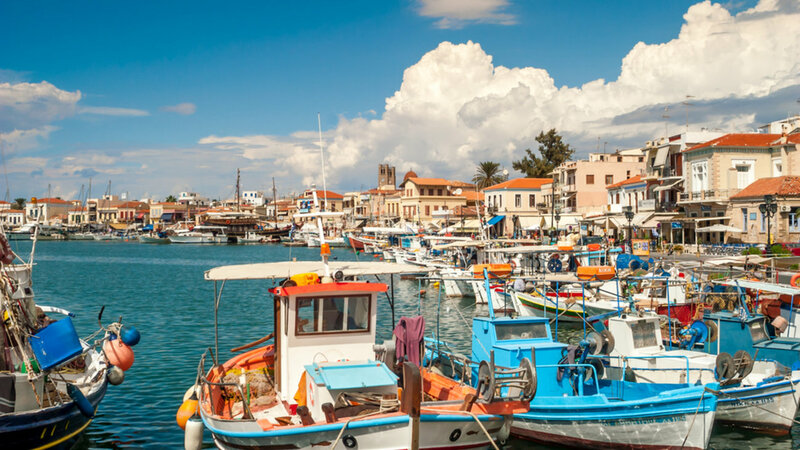 Beginning from the harbour in Aegina by car or by motorcycle or even by using public transport, you can visit the different beaches of the island, the many churches and monasteries and the archeological places of the island. Daily cruises are organized to take you around the island of Aegina and to the nearby islands of Argosaronikos like Agistri-Poros-Hydra-Spetses. Opposite Aegina, is Agistri which you can visit by small ships that leave daily during the summer from the port in Aegina. There is access from the island to Methana, Poros, Hydra, Spetses, Porto Xeli and Ermioni. Aegina is ideal for day trips and excursions. You can leave at 9:00 in the morning by ship from Piraeus, visit any island you want and be back at Aegina with the last ship.